Father's Day 2018 — Sunday, June 17 — yields terrific finds for all the dads in your life. The market is chock full of new products for guys, and we've hand-picked six favorites for dapper dads of any age. picnictime.com/legacy | $33.95 You’ll be the envy of the next picnic, backyard barbecue, picnic, tailgate or guys’ night out with this soft-sided cooler that holds six bottles of your favorite brew. The built-in, retractable bottle opener is genius! huckberry.com | $150 Tote your laptop (up to 15”) in style with this rugged, convertible bag offering three ways to carry — traditional briefcase, shoulder bag or backpack. The bag features function, comfort, quality and durability, and it also gives you quick access to pockets where you can store small items. gopro.com | $199 This new “entry-level” GoPro is a great action camera that’s easy to use. It’s made to go where smartphones can’t, including 33 feet under water! It captures 10 MP pics and 1440p60/1080p60 video. It features a touch screen and voice control. The Quick Stories function rolls your footage into the app to become a cool, edited video with music and effects. It hooks up via Bluetooth to any mobile device and includes two mounts and a USB charging cable. kitchenaidgrills.com | $299 Love to grill but have limited outdoor space? This compact grill is just for you. The two burners heat up a 457-square-inch cooking space. The grill features foldable side shelves, a heavy duty stainless steel cooking grade, and stainless steel burners and angled flame tamers that help distribute the heat evenly. Happy grilling and bon appetit! tastetro.com | $269 pre-order You’re king of the kitchen with this innovative automatic spice rack, Dad. It allows you to create 50 different spice blends from 20 different herbs and spices. You’ll be able to go to town creating steak rubs and other delights. Available February 2019, but you can pre-order yours now. Tame the Beast is a new Nashville-based company that’s taking the world of men’s products by storm. 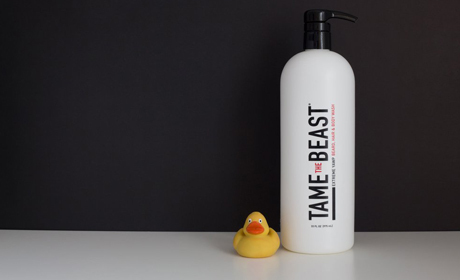 Of all the new products for guys we've tested, Tame the Beast is hands-down our top pick. From shower to shave to style to skin, Beast products are 100 percent made in the USA. The manly scents come from all-natural botanicals like eucalyptus, ginseng, guarana, green tea, pomegranate and moringa. The Extreme Yawp Wash is a must for your shower experience (the 33-0unce bottle for $34.99 lasts nearly six months). It’s an all-in-one hair, beard and body wash — the nice tingly experience will fully awaken you in the shower. The Hair Paste ($12.99) is the best hair-styling product available for maximum hold. Keep your whiskers healthy with the enriching Beard Oil ($19; try the Mint Slap version, too, for $11.99), and keep your “boys” moisturized and chafe-free with the luxurious Nutt Butter ($19) after you shower. The can’t-live-without item in the product line: Yawp Exfoliating Face Wash ($17.99). This superior scrub leaves your face fresh and taut.